The Motorola Moto X is said to mark a switch from the current focus on hardware and specs in smartphones and Android in particular to more of a discussion about functionality. Still, hardware matters and looks do too, and that’s why we've excitingly followed leaks and rumors about the upcoming Moto X. 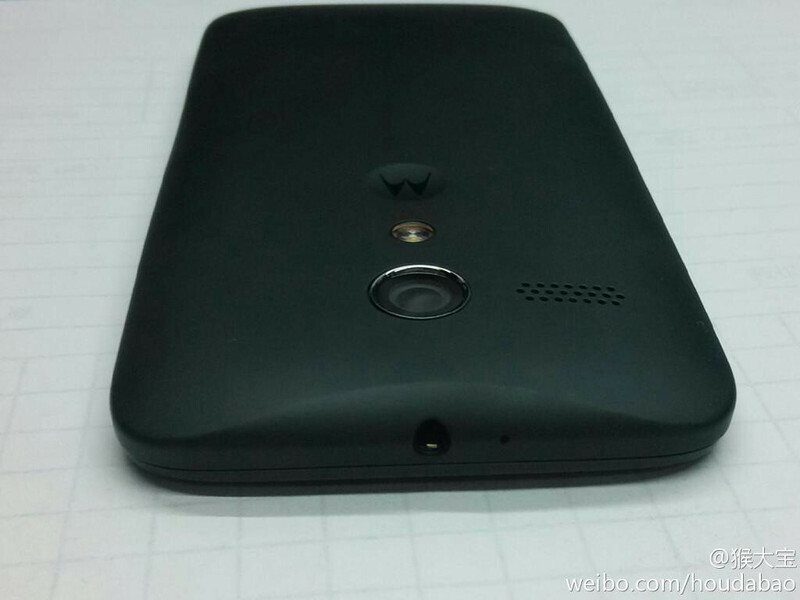 This latest leak coming from China finally shows a fully assembled Moto X for the first time. This is the black color version. 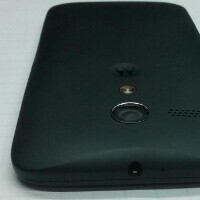 Just as on previous leaks, you’d notice the signature three-line speaker grill on the back, the centered camera with single LED flash and Motorola’s logo below it. You’d also notice the phone has got its 3.5mm headphone jack centered on top and its second microphone right next to it. What we can say is the obvious - the plastic on the Moto X looks a bit on the cheap side, but it’s at least a matte one so it won’t catch fingerprints. We have already seen back plates of the handset come in different colors, so that should be an awesome way to refresh the looks of it. Very minimalistic. I like it If it's polycarbonate unibody. Ha, got me checking French slang, did not know this one! The real story with the Moto X is about customization, though, keep that in mind. Come on Vic, cheap plastic really? What looks cheap is the glossy plastic that Samsung uses! That looks no way cheap! It looks smooth. Gloss does not necessarily mean cheap. Plastic can be relatively rigid and yet have a glossy finish. I do prefer gloss over matte for bright colors and matte for darker colors, because matte surfaces get stained easily, which will be visible on colors like white. Whether stains can be easily cleaned or not is a separate matter; i use rubbing alcohol to clean my phones sometimes. Agree...but i'm specifically bothered about the "cheap" name!! I so so wish companies would STOP putting speaker on the back is very bad design. I hope the Camera is excellent in day light & low light then this could be my next phone, I dont like all these Massive 5" screen phones. That's what I'm looking at too is the camera. Wish they would show the front. Yeah, but if this is to be an affordable phone ($300-400 US unlocked), should we expect a stellar camera, or just adequate? If they made it chubby to put in it a massive battery I don't mind the thickness. I prefer for the phone to last me all day, then to be made thin and have me searching for a plug by mid day. This is the cheap(er), international, dual SIM variant of the Moto X. The 'main stream' one is thinner with what seems to be a higher quality plastic. The speaker is on the other side (to make room for the second SIM card) which is the giveaway here. If what you said is correct, and the photo above is the motorola X, than this phone leaked by vietnam website (in march) is really the motorola X. Here's the video (with english subtitle) youtube.com/watch?v=3x8eKBFttro The specs matches what the evleaks says (1.7 GHz dual-core, 720p screen, 2gb ram.) Very mediocre specs. So thumbs up for the vietnam website! Yup. You are correct. I've seen that video many times before. It make sense considering Motorola said they were sick of the spec race and would use features to differentiate itself, not a spec race. Whoa, looks massive, hopefully sporting a good sized battery and large camera sensor. First... PA already posted this, so yeah! Second... What does this link have to do with the Moto X? Youre always free to get your news some place else if PA's speed is a problem. Some of us come here for a different perspective on the tech we like, not for get it now, get it fast reporting. Yeah plastic but looks good though, I want poly carbonate uni body. Maybe they wised up and realized "made in America" is just a slogan with an expensive price tag on it. It's not expensive to make things here in America, it just means less padding for CEO pockets. The more millions they can save overseas, the bigger the mansion they can build. We got to stop blaming American workers for CEO greed.